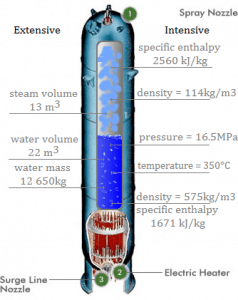 The enthalpy can be made into an intensive, or specific, variable by dividing by the mass. 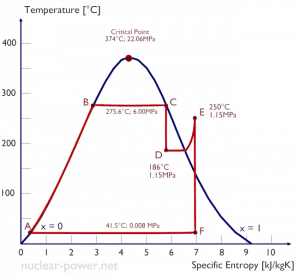 Engineers use the specific enthalpy in thermodynamic analysis more than the enthalpy itself. The specific enthalpy (h) of a substance is its enthalpy per unit mass. It equals to the total enthalpy (H) divided by the total mass (m). 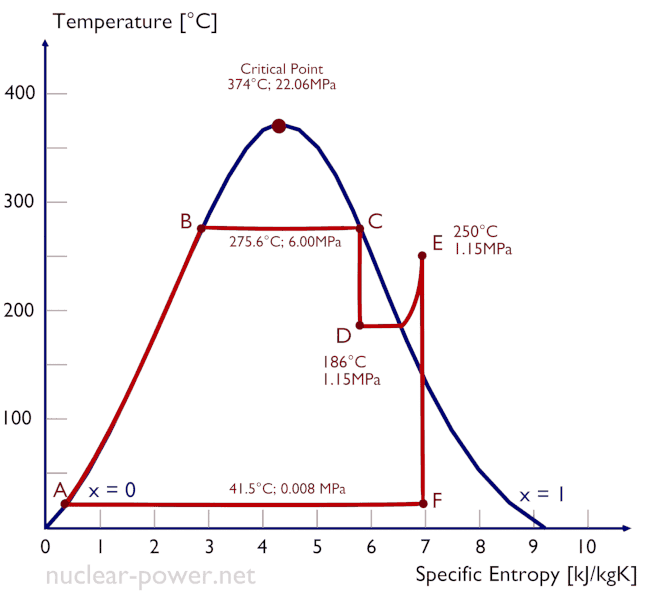 Note that the enthalpy is the thermodynamic quantity equivalent to the total heat content of a system. The specific enthalpy is equal to the specific internal energy of the system plus the product of pressure and specific volume. In general, enthalpy is a property of a substance, like pressure, temperature, and volume, but it cannot be measured directly. Normally, the enthalpy of a substance is given with respect to some reference value. For example, the specific enthalpy of water or steam is given using the reference that the specific enthalpy of water is zero at 0.01°C and normal atmospheric pressure, where hL = 0.00 kJ/kg. The fact that the absolute value of specific enthalpy is unknown is not a problem, however, because it is the change in specific enthalpy (∆h) and not the absolute value that is important in practical problems. Calculate the amount of primary coolant, which is required to evaporate 1 kg of feedwater in a typical steam generator. Assume that there are no energy losses, this is only idealized example. 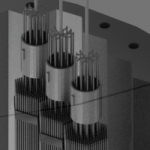 The hot primary coolant (water 330°C; 626°F; 16MPa) is pumped into the steam generator through primary inlet. The primary coolant leaves (water 295°C; 563°F; 16MPa) the steam generator through primary outlet. 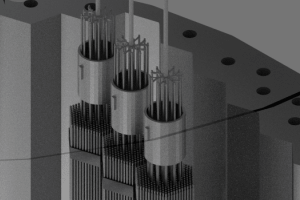 The feedwater (water 230°C; 446°F; 6,5MPa) is pumped into the steam generator through the feedwater inlet. The feedwater (secondary circuit) is heated from ~230°C 446°F to the boiling point of that fluid (280°C; 536°F; 6,5MPa). 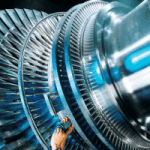 Feedwater is then evaporated and the pressurized steam (saturated steam 280°C; 536°F; 6,5 MPa) leaves the steam generator through steam outlet and continues to the steam turbine. Since the difference in specific enthalpies is less for primary coolant than for feedwater, it is obvious that the amount of primary coolant will be higher than 1kg. 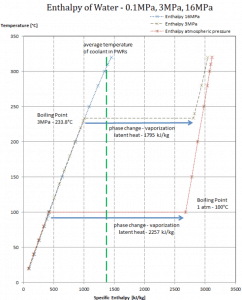 To produce of 1 kg of saturated steam from feedwater, about 1789/206 x 1 kg = 8.68 kg of primary coolant is required. The heat of vaporization diminishes with increasing pressure, while the boiling point increases. It vanishes completely at a certain point called the critical point. 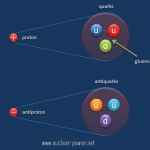 In general, when a material changes phase from solid to liquid, or from liquid to gas a certain amount of energy is involved in this change of phase. 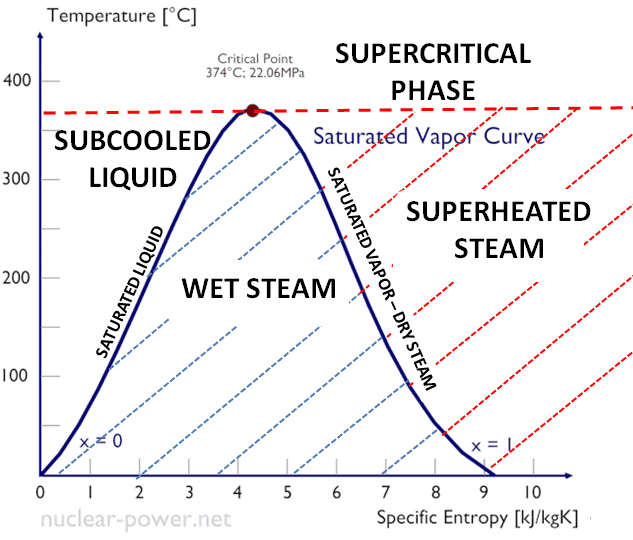 In case of liquid to gas phase change, this amount of energy is known as the enthalpy of vaporization, (symbol ∆Hvap; unit: J) also known as the (latent) heat of vaporization or heat of evaporation. Latent heat is the amount of heat added to or removed from a substance to produce a change in phase. This energy breaks down the intermolecular attractive forces, and also must provide the energy necessary to expand the gas (the pΔV work). 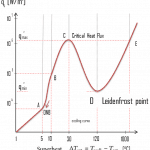 When latent heat is added, no temperature change occurs. The enthalpy of vaporization is a function of the pressure at which that transformation takes place. 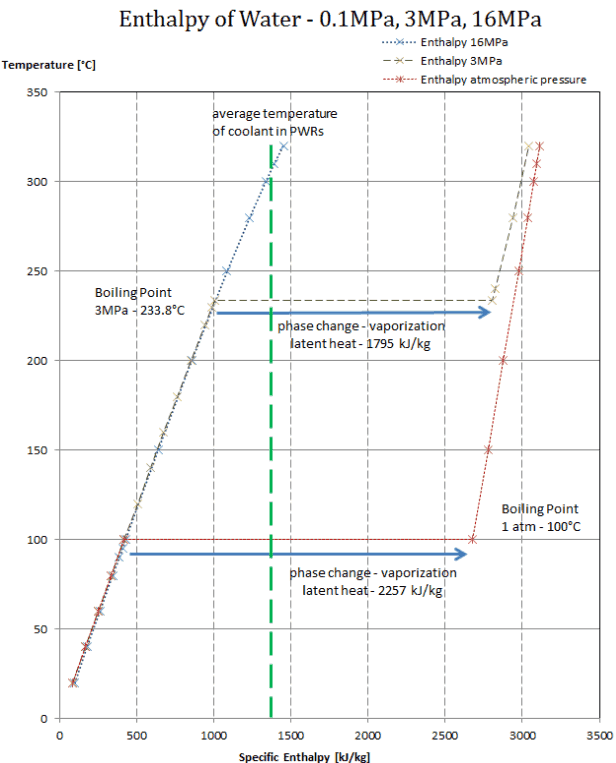 The heat of vaporization diminishes with increasing pressure, while the boiling point increases. It vanishes completely at a certain point called the critical point. 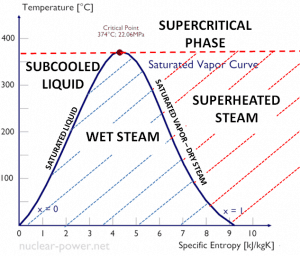 Above the critical point, the liquid and vapor phases are indistinguishable, and the substance is called a supercritical fluid. The heat of vaporization is the heat required to completely vaporize a unit of saturated liquid (or condense a unit mass of saturated vapor) and it equal to hlg = hg − hl. 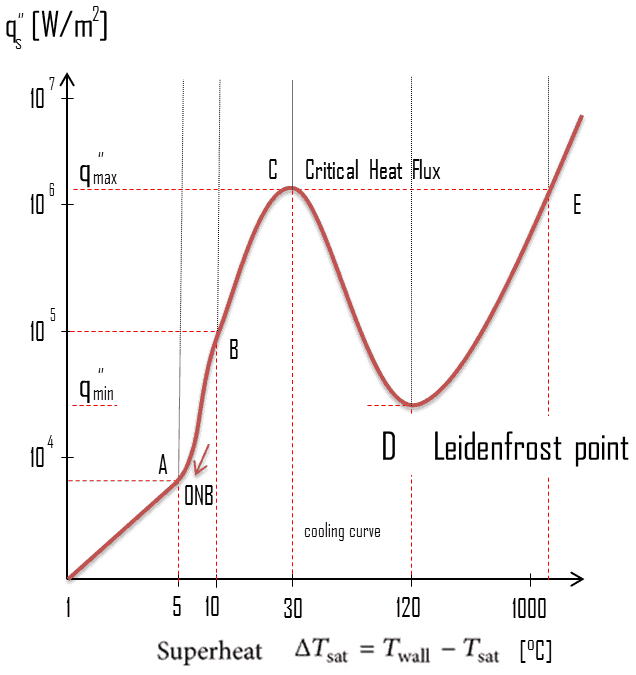 The heat that is necessary to melt (or freeze) a unit mass at the substance at constant pressure is the heat of fusion and is equal to hsl = hl − hs, where hs is the enthalpy of saturated solid and hl is the enthalpy of saturated liquid. Latent heat of vaporization – water at 0.1 MPa. Dominant part of heat absorbed. As can be seen, wet steam will always have lower enthalpy than dry steam. A high-pressure stage of steam turbine operates at steady state with inlet conditions of 6 MPa, t = 275.6°C, x = 1 (point C). 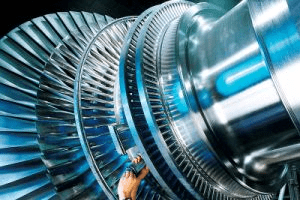 Steam leaves this stage of turbine at a pressure of 1.15 MPa, 186°C and x = 0.87 (point D). Calculate the enthalpy difference between these two states.